At EuroCIS 2016 in Dusseldorf METTLER TOLEDO presented the METTLER TOLEDO DistributionServer. This is the central unit in METTLER TOLEDO RetailSuite, the modular software suite facilitating centralized scale management for the efficient distribution of software and data. One single platform for all scales, elimination of double data entry and hence double work and easily manageable homogeneity of the entire network of installed devices – these are just some of the advantages of the modular METTLER TOLEDO RetailSuite of software that enables centralized, fast and cost-efficient management of METTLER TOLEDO network scales. Grocery retailers using METTLER TOLEDO RetailSuite benefit from simple and convenient distribution of any product or con-figuration changes across their entire network of scales. As a result, METTLER TOLEDO RetailSuite offers re-tailers the opportunity to completely centralize their configuration, software and data management and to elimi-nate local servers altogether. Furthermore, the software suite enables them to easily monitor the status of all net-worked scales. They also receive automated email alerts in the case of technical problems or status changes. METTLER TOLEDO RetailSuite supports METTLER TOLEDO network scales from the new FreshWay series of touchscreen models, which are being demonstrated for the first time at EuroCIS 2016, as well as the earlier generations of scales: UC3 Touch and UC Evo Line. The software suite is also compatible with METTLER TOLEDO’s bC Line of scales with tactile keypad. As the core module of RetailSuite, METTLER TOLEDO DistributionServer controls and monitors the distribution of software, patches and data to all scales within the network. This includes the distribution of data from other METTLER TOLEDO RetailSuite modules as well as data from the retailer’s ERP system. The intuitive user inter-face provides information about the status of all scales at a glance. Furthermore, that information can be sorted by branch, region or category in line with the user’s own personal requirements. Simply clicking on a specific scale will display detailed information about its status and current configuration settings. For extra convenience when checking status, METTLER TOLEDO DistributionServer facilitates very detailed access to folders at all operational levels, as well as insight into all log files at device level. Whether for software and configuration updates, new label definitions or changes to the layout of the touchscreen or PLU key allocation, alterations can be made quickly and easily with METTLER TOLEDO DistributionServer thanks to the drag-and-drop functionality. At the same time, the module manages all planned changes to the scale configuration. An integrated scheduler enables precise planning of all activities so that up-dates can be preset to be performed at a predefined time. Alternatively, the installation moment can be programmed into the update so that it does not impact on the operational uptime of the scale. Likewise, METTLER TOLEDO DistributionServer makes it easier to install new scales when a new store opens. After being pre-configured in line with the retailer’s requirements, the scales are connected to the network via remote installation. As soon as a scale is online, the DistributionServer recognizes it as new hardware. After just a couple of mouse clicks at the helpdesk of the head-quarter, the scale is assigned to the relevant store and receives the applicable profile information and data. Therefore, METTLER TOLEDO DistributionServer is also an ideal centralized maintenance tool for the scales network and helpdesk employees. In the case of technical problems, centrally based support engineers can diagnose the device via a remote connection and can help in-store employees to resolve the problem quickly and easily. If, for example, a sales employee has inadvertently changed a scale setting or cannot find their way back to the start screen, a member of the support team can provide remote assistance and restore the scale to its original state in just a few mouse clicks. 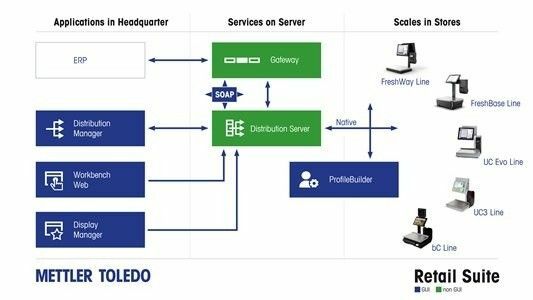 With METTLER TOLEDO DistributionServer, retailers are assured of both fast integration and implementation of newly installed scales as well as the rapid distribution of application and configuration changes to all scales in their existing network. In conjunction with this, the METTLER TOLEDO DistributionManager module of METTLER TOLEDO RetailSuite provides convenience in terms of management and visualization, such as the operational status of the scale network and a check of whether hotfixes have been distributed successfully.